Talk about a blast from the past! 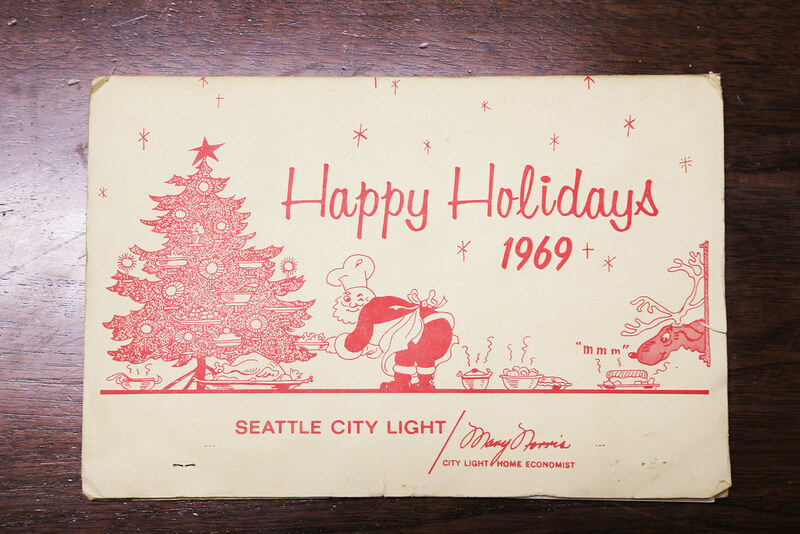 A member of City Light’s Power Marketing team recently found this holiday mailer from 1969 in a stack of documents. The manila cover and carbon paper interior include scrumptious recipes like Brisk Cherry Salad and Quick Lemonade Bread (and yes, one of the ingredients is frozen lemonade concentrate) along with beautifully designed kitchen appliances and holiday-themed characters. The back cover encouraged the reader to consider adding a “major electric appliance” to their holiday wishlist. This (at the time) annual piece was developed for City Light’s Home Economics Division and included the venerable Mary Norris’ signature of approval (read about Mary’s lasting legacy at City Light here!). Check out our Flickr album above and tell us which recipe you’re want to make for your next holiday gathering! This holiday season, City Light partnered with Starbucks to gather donations of gifts and funds for Treehouse, a local non-profit organization which provides foster children in Washington state with the support they need to thrive. In its second year, the duo spread their holiday cheer across Seattle’s downtown core by expanding the number of donation sites including 14 Starbucks locations. 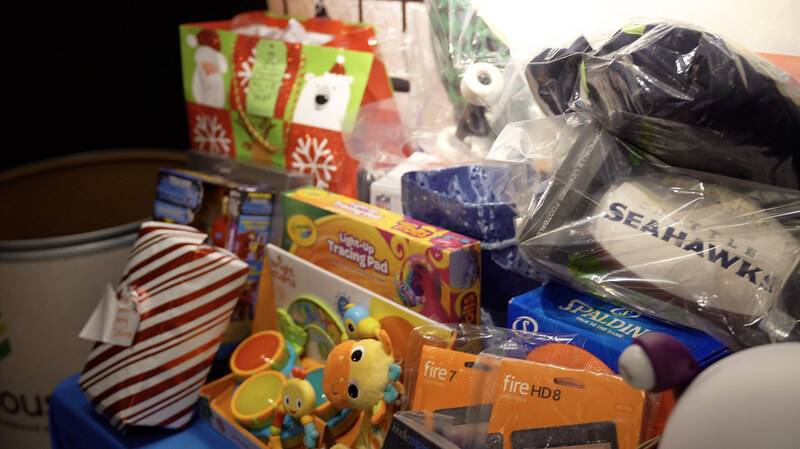 As of Dec. 21, the drive garnered more than 300 gifts including clothing, toys, tech gadgets, etc. for kids of all ages and raised $5,200 in monetary funds, exceeding its initial goal of $2,000, which will go directly to Treehouse to further their efforts! Here is a breakdown of this year’s drive! To learn more about Treehouse and to donate to their cause, visit treehouseforkids.org. Yesterday, a windstorm blew through Western Washington. Almost 300,00 people lost power throughout the region as wind gusting over 60 mph battered trees and blew them into contact with power lines. In the Seattle City Light service area, 40,000 customers lost electricity over the course of the day. City Light crews worked throughout yesterday afternoon and evening to restore power to those customers. As the day came to an end, approximately 4,000 City light customers remained without power. At this moment, City Light’s overhead, underground and vegetation management crews are continuing their work throughout the service area to bring power back to everyone. City Light crews expect to restore service to almost everyone by this afternoon. Here’s what City Light customers can expect as the outage restoration process moves forward today. It’s going to take a while to reach everyone. After threats to life safety and emergency services are addressed, City Light restores power in the order which will benefit the most customers. That’s why outages that affect thousands are resolved before outages that affect dozens. Once the large outages are remedied, the restoration process moves to medium-sized outages, and so on. Are you the only person without power in your neighborhood? If so, you won’t be the first stop for a crew in your area. We have over a hundred outages across our service area, and that’s a lot of individual outages to address. Don’t worry, though. Help is on the way. Here’s a graphic to more fully explain the process. Working in the dark is more difficult. City Light crews are used to working in adverse conditions, but it is an inescapable fact that doing line work in low light makes the job more difficult. This is another factor that will contribute to delays as work continues overnight. But that doesn’t mean work comes to a halt! It just means it’s time for a shift change. It may take a few extra minutes to bring the new folks up to speed on current restoration efforts. We won’t stop working until the job is done. At City Light, we take great pride in serving our community. It’s our community too! We want to restore your power as quickly as possible, and we’re going to do everything we can to accomplish that goal safely and efficiently. For more updates, follow our Facebook and Twitter channels. Information is also available on our power outage map. Thanks for being patient as we work to bring power back to everyone throughout our service area! Seattle City Light recently funded a study which researched and forecasted the recession patterns of glaciers in our region. The research article, titled “Glacier Recession and the Response of Summer Streamflow in the Pacific Northwest United States, 1960-2099,” explores the recent recession patterns of these glaciers whose melt and water flow will impact hydroelectric power generation, agricultural water supply, and the ecological health of the watersheds downstream. Along with funding a portion of the research, City Light advised on the scope of the project to provide insight into when streamflows were most important for power generation, recreation, and fish protection. Through hydrological modeling, the study found that primarily temperature-induced shrinking of glaciers will increase throughout this century. The model showed that the glaciers in the North Cascades could nearly disappear by the year 2100 if greenhouse gas emissions are not curbed. For Ronda Strauch, City Light’s climate change adaptation researcher and adviser, this research is vital to not only the health of the glaciers but shapes how utilities that generate power with hydroelectricity like City Light will continue their operations in the future. One of the consequences is the potential lowering water levels along the Skagit River during late summer. In keeping with City Light’s commitment to environmental stewardship, such as supporting the salmon recovery plan that protects and restores the chinook, bull trout and other species listed under the Endangered Species Act in the Skagit Watershed, the utility is watching closely this kind of research to better understand the changes in climate the region will incur for decades to come. Click here to read the abstract of the research article. UPDATE: As of 6:38 p.m. (12/16/18), there are 13 remaining outages from Friday’s windstorms impacting 43 customers in north & south Seattle. The majority will be restored by midnight. Crews are setting service poles & working as quickly and safely as possible. UPDATE: As of 6:11 p.m. (12/15/18), crews continue to repair damage with 384 customers currently without power. The numbers continue to decline as work is being completed. UPDATE: As of 4:28 p.m. (12/15/18), power has been restored to the majority of customers who were impacted by last night’s windstorms. Our crews continue to work to restore power to the remaining amount, which is currently at 737 customers. UPDATE: As of 7:10 a.m. (12/15/18), there are approx. 3,500 customers without power in the North end. Approx. 1,400 of those are due to a tree on a feeder. In Magnolia, approx. 650 customers are without power due to a tree in a corner pole. Both of these jobs have crews onsite making repairs. In the South end, crews have been working all night to restore power to the White Center/Burien area. A couple of feeders are down, causing outages. UPDATE: As of 6:11 a.m. (12/15/18), power is still out for approx. 13,000 customers. The number of impacted customers is slowly declining and we thank you for your patience as our crews work to restore power! UPDATE: As of 4:10 a.m. (12/15/18), power is still out for approx. 19,000 customers. It’s been a long, cold night. A few tips to stay warm: camp out in a small room of your home, close your windows properly, seal your doors and do NOT use a generator indoors as exhaust contains carbon monoxide. UPDATE: As of 1:11 a.m. (12/15/18), there are 31,324 without power. In the South end, four feeders are out which is impacting approx. 20,000 customers. In the North end, approx. 8,400 customers are out due to a tree on a feeder. Both incidents are being assessed. UPDATE: As of 11:00 p.m. (12/14/18), 37,692 customers are without power. We’re starting to receive reports of power being restored to different areas which is good news. In the meantime, bundle up with blankets and sweaters, use flashlights and keep your refrigerator and freezer doors closed! UPDATE: As of 8:55 p.m. (12/14/18), more than 45,000 customers are still without power. Remember, that downed power lines due are extremely dangerous. Stay at least 20 feet away and report them to 206-684-3000. If you find yourself near a downed power line, don’t walk or run…SHUFFLE at least 20 feet away. This Seattle Channel video featuring Field Operations Supervisor Ed Hill shows how. UPDATE: As of 6:52 p.m. (12/14/18), more than 40,000 customers are without power. Crews have been called in and are working quickly (and safely) to restore power. We’ll continue to provide updates. Thanks for your patience! ORIGINAL (12/14/18): More than 13,000 customers are without power in Seattle due to high winds sweeping across the Puget Sound. The outages began in West Seattle around 5:40 p.m. this evening and soon began to spread across the city. We will continue to provide updates as information becomes available. Updates are being shared on our Facebook and Twitter channels. Information is also available on our power outage map. Thank you for your patience as our crews work quickly (and safely) to restore power. 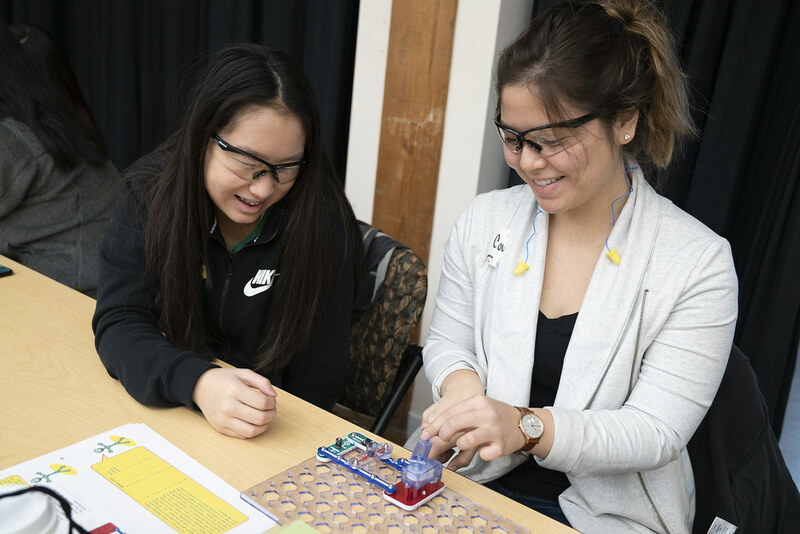 On Saturday, Dec. 8, City Light hosted 25 young women from the SPIN Girls group for our first ever STEAM in Power Workshop. Our Community Outreach team created the program, partnering with the Lighting Design Lab to host the event and with STEM Paths Innovation Network (SPIN), a Seattle non-profit dedicated to creating equity and opportunities for youth to succeed in science, technology, engineering, arts and math (STEAM). The interactive workshop included a tour of the lab, a brief introduction to City Light and our mission, an Electricity 101 lesson, hands-on building of electrical circuits and a meet-and-greet activity featuring 16 women from across the utility who work in a variety of STEAM fields, including engineering, skilled trades, environmental , customer care, financial services and the technical arts. Dejene was born in Ethiopia. He moved to the United States in 2007 with one destination on his mind: Seattle. “I had family living in Tampa, Florida, but a friend suggested I study engineering at the University of Washington,” he shared. “So, I headed straight to Seattle, to join UW.” He graduated with a degree in electrical engineering from University of Washington and went on to receive his master’s degree in electrical power engineering from Washington State University. Dejene and his wife Hana live in Lake Stickney with their six-year-old son Yoseph. In this week’s (spot)Light, Dejene talks about his work and shares a few of his favorite activities. Jessica grew up in Iowa. “I lived in Des Moines which is a small town, but is probably one of Iowa’s bigger towns,” she said with a laugh. “A few of my friends were living in Portland, Oregon and I decided to make the move and join them.” Eventually, she ended up in Seattle and lives in First Hill with her husband Jeff. In this week’s (spot)Light, Jessica talks about her career path and shares her creative flair. City Light recently acquired 61 acres of land along the Skagit River near Rockport, including approximately 1,500 feet of river frontage in a critical spawning reach of the Skagit River. The property is adjacent to other City Light, Skagit County and Washington Department of Fish and Wildlife properties. This acquisition further expands and protects this vital corridor of fish and wildlife habitat. Denise Krownbell of City Light’s Environment, Land and Licensing Business Unit acquired the property primarily with Salmon Recovery Funding Board grant funds and supplemented by a portion of City Light funds. These funds are targeted at supporting Endangered Species Act listed species, in this case predominately steelhead, through acquisitions of critical areas, particularly those that include spawning and rearing habitat. To learn more about City Light’s commitment to revitalizing and maintaining salmon habitats, visit www.seattle.gov/light/greenest/naturetested.asp.